The Anti Slip Tape is base on quartz sand which is high traction, anti-slip and waterproof, coated with acrylic adhesive. It is for use indoors or outdoors on walkways, ramps, stairways; in machine shops, work areas, etc. The tape is a single roll of 2" x 32.8 Feet. It is also known as Anti slip tape, Non-slip tape, Anti skid tape, Non-skid tape, Grip tape, Floor safety Tape, Safety Walk tape, Safety grip tape, Stair tread tape, Skid resistant tape, antislip tape, anti-slip tape. The Anti Slip Tape is OK to use on surfaces that are clean, dry, flat and smooth such as: stairs, steps, tile, marble, wood, flooring, plastic, glass, metal. Don't use on surfaces that is dirty, oily, uneven, rugged, rough, dusty, grimy, sandy, muddy, wet, watery. 9.Don't touch the liquid and don't remove it within 24 hours. All grit tape will show dirt or fuzz balls that stick to it, but how to clean up when you do not need it: with a soft cloth dip alcohol or soapy water, and then gently wipe the paste site, it will become easy to fall off the glue. 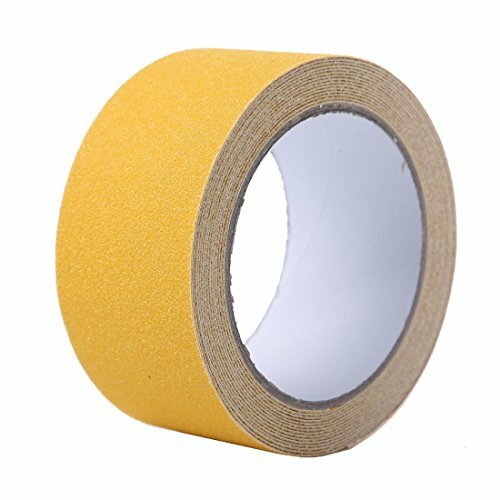 2 INCH x 10 METER (32.8 FEET) SINGLE ROLL: Enough for you to use, Anti slip tape works well on both indoor and outdoor surfaces. Safety tread grit anti slip tape with excellent wear resistance. 60 GRIT QUARTZ SAND: For better anti-skid effect, made with PVC and quartz sand. Weather and waterproof, making it ideal for ensuring safety on steps, ladders, ramps, trailers, decks and other safety equipment. Adheres well on concrete, tiles, wood, metal and plastic. EASY TO USE AND CUT: Just peel and stick to stairs, wood, stainless steel, ramps and more. You can arbitrarily cut out the size you want and simple to apply as long as the surface is clean and dry. STRONG ANTI-SLIP ABILITY: Anti Slip Tape that withstands extreme weather, adheres well to a variety of surfaces and prevents slipping. The tapes improve safety of your place and help to reduce the risk of injuries and cracked bones. STRONG ANTI-SLIP ABILITY: Anti Slip Tape that withstands extreme weather, adheres well to a variety of surfaces and prevents slipping. The tapes improve safety of your place and help to reduce the risk of injuries and cracked bones. IDEAL FOR INDOOR AND OUTDOOR USE: Helps create a safer environment for walking, working, stepping and standing. The ANTI SLIP TAPES help you to get rid of the dangerous of slipping. If you have any questions about this product by EONBON, contact us by completing and submitting the form below. If you are looking for a specif part number, please include it with your message.